One of a Kind Sound from Epiphone's Glorious Past! In 1957, Gibson purchased the Epiphone Guitar Company and moved all Epi instrument production to Kalamazoo, Michigan. A new line of "Kalamazoo-made and designed" Epiphones began hitting stores in 1959 and for the next decade, Epiphones were produced right alongside Gibsons. These Epiphone guitars represented some of the highest quality and best sounding instruments of their generation offering players unique shapes, pickup arrangements, and tonal signatures not found on '60s Gibson models. Though many of the early Epiphone instruments made in Kalamazoo were under-appreciated at the time of their release, numerous artists through the years recognized the unique appeal of these guitars including Jimi Hendrix, Johnny Winter, Kurt Cobain, and Steve Marriot. One of the best Epiphone guitars from the early Kalamazoo days was the Wilshire. 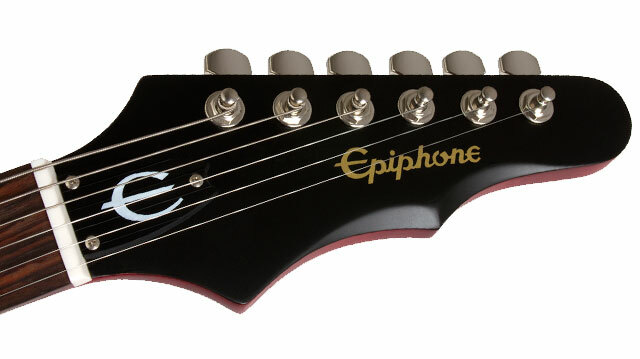 As with all Epiphones, the Wilshire is backed by Epiphone's Limited Lifetime Warranty and 24/7/365 Customer Service. Only 398 original 1966 Wilshires were produced and are selling today for $10,000 or more. If you're not fortunate enough to own an original or can't afford that kind of cash, here's your chance to own one with the same classic 1966 Epiphone vibe and tone. Like an SG guitar, the Wilshire's double cutaway mahogany body has a glued-in mahogany neck with ‘60s SlimTaper™ profile and a rosewood fingerboard that joins the body at the 22nd fret, giving you ultimate upper fret access. Lightweight and comfortable, the Wilshire has excellent resonance and natural acoustic tone - even unplugged! The Wilshire also features Epiphone's own "batwing" headstock. A classic design that improves tuning ease and accuracy by offering a straight string-pull design, the headstock is adorned like the original with the vintage "Epiphone" logo in gold. But here's what separates the Wilshire from the SG. Most early Epiphone guitars including the Wilshire were equipped with mini-humbucking pickups and Epiphone carries on this tradition. With its smaller size, narrow magnetic field and unique design combination, the NY mini-humbucker produces bright and focused output while retaining famous humbucker "hum-free" performance. Featuring adjustable pole pieces, enamel wire, bar ceramic magnets and rounded nickel plated covers set in an original style black mounting ring with height adjustment screws. There's been a lot of tremolos developed over the years but few as unique and distinctive as Epiphone Tremotone with a rosewood insert and metal "E" insignia. 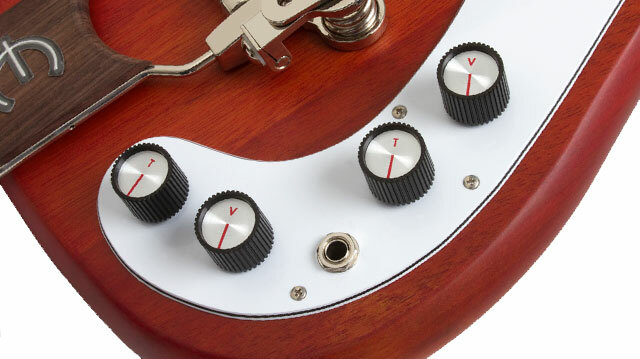 Introduced in 1961, it was optional equipment on many classic Epiphone models. 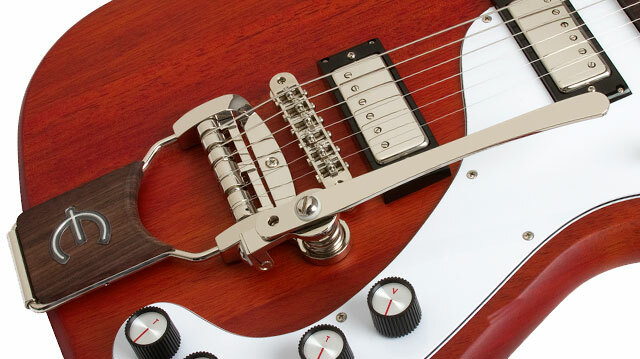 Now, Epiphone engineers have taken that same, great design and improved it with a spring-loaded return system that allows for ultra-smooth operation and excellent return-to-pitch characteristics. Featuring Epiphone's ever steady LockTone™ Tune-o-Matic Stopbar combination, the transfer of string vibration is improved even more giving this guitar excellent sustain and clarity. 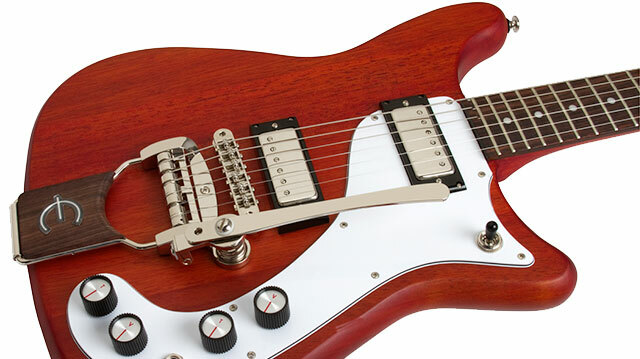 Other features include a premium 14:1 die-cast tuners and individual Volume and Tone controls for each pickup. And to give it that worn-in look and feel, Epiphone tops it all off with a thin satin finish available in Worn Cherry (WC).